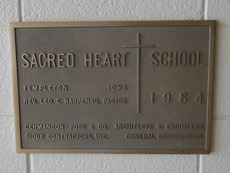 Construction on the Sacred Heart School in Templeton began in 1963 and was first opened for classes in the fall of 1964. The cost of the building and furnishings was approximately $260,000, and the building replaced the old high school that was built in the 1880's. In the late 1960's and early 1970's, Sacred Heart combined with St. Augustine Parish in Halbur and Holy Angels in Roselle to form the H-T-R, and later Holy Trinity, school system. Classes were held in the schools in Halbur and Templeton until 2003, at which time all of the parochial grade schools in Carroll County were merged into the Kuemper Catholic School System in Carroll. The school in Templeton has unofficially served as a community center since it opened. Over the years many community functions have been held in the school and on the surrounding grounds. Shortly after the school closed in 2003, many unofficial conversations began with various local groups and individuals about the future of the school building. Because it is the "de-facto" community center in Templeton, it is valuable to the community, but many repairs are needed due to the building's age. Continued ownership by Sacred Heart Church limits any improvements made to the building, as ultimate control over such work is maintained by the Sioux City Diocese. Without repairs in the near future to the roof, windows, doors, etc., the building could soon deteriorate to the point that it is no longer useful for a community center. No one in Templeton wants to see a boarded-up, dilapidated old school building in such a progressive and neat community. The cost to remove the asbestos and demolish the building would also be significant. Access to church for funerals, weddings, etc. The committee began working with Clark Snyder from Simonson Associates Architects in Des Moines on needed improvements to the building. The group visited other community centers in neighboring communities to determine what features would be desirable, and set forth the goal to have an effectively new building that will need minimal attention other than normal maintenance over the next 25 years. The planning committee developed an exciting plan for the building that will result in a vibrant, modern multi-purpose community center for Templeton. Details on the plan and the project, which is now underway, can be found in the "Project Plan" section.